Please send me a PM if you have one in good working order. 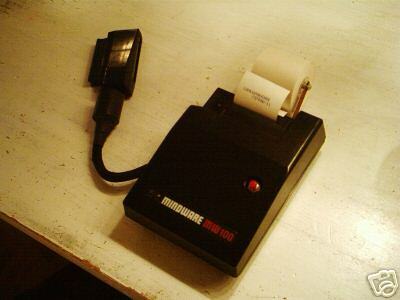 If the manual and any other items that came with the printer are included, the value increases. I took a trip down memory lane when I found this post for the MW100 after all these years. I was selling a range of game cartridges for the ZX81, I demonstrated one of our game cartridges to Mindware who then asked my company Mendora Electronics Ltd to develop the prototype MW100 printer as the original Sinclair ZX81 printer gave off cadmium fumes stopping it being accepted for sale in the USA. I was very pleased in the way I got the printer to work directly with the same instructions set used by the ZX81/Timex1000, The software in the printer worked by electronically swapping out the firmware every time a printer command function was called, then re-enabling the ZX81 firmware when the print function I had written was completed. Hi Timothy!! Glad to see you here! status we may be able to release it. It is not going to get destroyed. Do you have one of those printers for sale? Do you still have any material related to it? Please tell us more. Tell us some stories from back in the day! TheCoolBrit wrote: I took a trip down memory lane when I found this post for the MW100 after all these years. Game cartridges? Did I miss something or does he mean cassettes? Unfortunatly I no longer have any hardware or software, I only had the original hand wired (by Chris Pittock from Watford) prototypes, we only ever got one preproduction MW100 in a prototype moulding from Michael Levy (Mindware) for testing in the UK, all the tooling, PCB and the case were completly done by Mindware Inc in the USA. I don't recall anyone named Walter Banks but I guess he was from the USA working with the production prototypes. As Mendora Electronics we only made a few game cartridages, using 4k x 8bit 2732 EPROMS ecapsulated in black epoxy resin that pluged into the ZX81 RAM expasion port, but in those days 4k bytes was a lot, particually as we had decoded all the ZX81 firmwear. I also wrote some software for the TimeX 1000 as you could do so much more with its 2k of memory, The ZX81 only had 1k but I did make a Startrek program work in just 1k using a 10x10 character grid, fun days. What a bygone era, I do hope you can keep these memorys going. I found that I have a Mindware MW100 printer as part of a job lot of things. It looks like it's missing parts like a spool and ribbon setup, but not sure what else because I haven't found a ton of information about the printer online. I'd really like to get it up and running though if possible, does anyone here have any pointers to information and possible parts? This Danish book store still has ribbons for it. But the picture of the ribbon is quite huge compared to the size of the printer.